One of the beauties of modern technology (thank-you, clever Google Analytics!) is that while you can’t identify who, when or why somebody’s visiting your website, you CAN see how they’ve arrived there. For example, did they click through from Facebook or Twitter? Did they type ”shark toy party” (hey! It happens!) into Google and BAM, somehow magically arrive at one of your pages? I was wondering why so many people had apparently been searching for ”Corrine Lynskey Frock & Roll” in the past 24 hours. Um, I wager that this would be why! 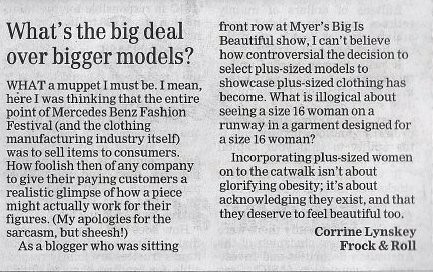 This (an edit from this piece here) was published in the The Manly Daily newspaper yesterday and I HAD NO IDEA. How terrifying! I feel so weirdly… exposed! (Which is ridiculous, because I’m not secretive about Frock & Roll in the slightest, but I guess that if anyone in the area didn’t know that I was blogging… THEY DO NOW!) Yikes indeed!